If you are on the water and see fire fighting aircraft skimming the waterway, stay clear and avoid endangering the aircraft crew and those on your vessel. In BC, if you spot a wild fire or irresponsible behavior call 1 800 663-5555 or *5555 from a cell phone. In Alberta, call 310-FIRE (3473). Please check your provincial government website for the emergency number for your province. Remember; flying a UAV or drone anywhere near a wild fire or near working aircraft endangers fire fighters on the land and in the air. It is also against the Aeronautics Act and could result in criminal charges. This New Year’s Eve, boaters will gather off Canada Place in Vancouver Harbour to take in the fireworks display and usher in 2018. Cold weather is predicted for New Year’s Eve in the Vancouver area and it is anticipated that many boaters taking in the fireworks, will be inside their vessel cabins. The potential for Carbon Monoxide poisoning is heightened in enclosed spaces and by the use of fuel burning heaters. 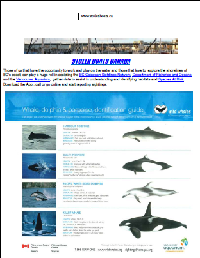 It is recommended that all vessels be fitted with a CO detector. Boaters should become familiar with where CO can accumulate, the symptoms and what to do if you suspect CO poisoning is taking place. 911 for Emergency Services or Ch. 16 VHF/ *16 cell Phones for Canadian Coast Guard. Early symptoms of CO poisoning include irritated eyes, headache, nausea, weakness, and dizziness. They are often confused with seasickness or intoxication, so those affected may not receive the medical attention they need. in limited visibility or in the dark). traffic hazards in the area and anticipated weather changes. Wear your board leash, let others know when and where you are headed out on the water, when you anticipate returning and check in on your return. On July 1st 2017, several people on a vessel in Vancouver Harbour were overcome by Carbon monoxide (CO) and had to be rushed to waiting ambulances by the North Vancouver RCMP and other SAR vessels. In preparation for the upcoming Celebration of Lights festival nights in English Bay, boaters are being reminded of the danger CO presents. It is recommended that all vessels be fitted with a CO detector. 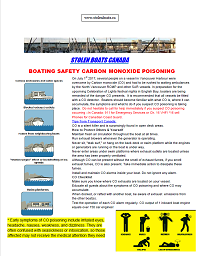 Boaters should become familiar with what CO is, where it can accumulate, the symptoms and what to do if you suspect CO poisoning is taking place. With the arrival of the good weather, there has been an increase in the number of near collisions in the traffic lanes on the approaches to the First Narrows in Vancouver. In several cases, transiting cargo ships and tug and barges have been forced to take evasive actions to avoid collisions caused by pleasure craft contravening the Canada Shipping Act rules pertaining to Operating in a Traffic Separation Scheme and Operating in a Narrow Channel. In the most recent incident, a pleasure craft passed between a tug and its log boom, fortunately missing the steel cable sub surface between the tug and its boom. 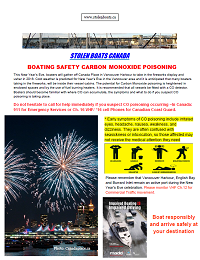 With the upcoming Canada Day fireworks in Vancouver Harbour and the annual Celebration of Lights in English Bay, the risk of dangerous encounters between commercial vessels and pleasure craft will be increased. When operating around commercial vessels, stay clear and check to see if there is a boom or barge behind every tug before cautiously crossing well astern. Keep to the Right side of the channel, Keep a Lookout, travel at a Safe Speed and have your VHF scanning Channels 12 and 16 when transiting through English Bay and Vancouver Harbour. 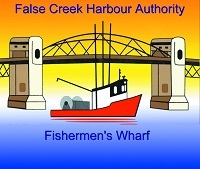 Transport Safety Board report: Collision Between the Pleasure Craft Sunboy and the Tug Jose Narvaez Towing the Barge Texada B.C. Those of us that have the opportunity to work and play on the water and those that love to explore the shorelines of BC’s coast, can play a huge roll in assisting the BC Cetacean Sightings Network, Department of Fisheries and Oceans and the Vancouver Aquarium, gather data to assist in understanding and identifying habitats and Species At Risk. Download the App , call or go online and start reporting sightings. Many boaters are preparing to head out on the water again to enjoy another great boating season on the west coast. 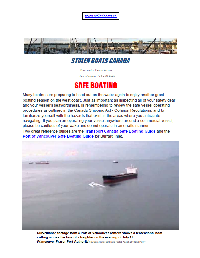 Just as important as inspecting all of your safety gear and your vessel’s seaworthiness, is remembering to review the safe vessel operating procedures as outlined in the Canada Shipping Act - Collision Regulations, and to familiarize yourself with the hazards that exist in the areas where you anticipate navigating. If you plan on operating your vessel anywhere around a commercial vessel, please be cautious of your wake and do not operate in an erratic manner. Two great reference guides are the Transport Canada Safe Boating Guide and the Port of Vancouver Safe Boating Guide for Burrard Inlet. The 2016 Celebration of Light will be taking place in English Bay on July 23rd, 27th and 30th. Please ensure you take all steps necessary to keep everyone safe on the water. Check tides, weather and hazards for the area and have all required safety gear. Be mindful of commercial traffic and do not pass between a tug and its tow. Coast Guard, RCMSAR, Jericho Rescue and Police can be reached on VHF 16 or by calling 911. When launching and recovering your vessel, check the tides, have knowledge of your vehicles capabilities, the characters of the ramp and what type of surface is under the water. If your vehicle gets stuck, do not put yourself or others in danger of getting trapped under your vehicle in an attempt to free it. Contact a professional tow company in “ample time” to avoid damage to your vehicle, potential injury and environmental damages. Many communities struggle with the task of dealing with abandoned and wrecked vessels that may cause environmental and safety hazards to their waterways and foreshores. In many cases the vessel owners fail to take responsibility for their vessels. Organizations and responsible boat owners have some options for resolving this issue. It is recommended early action is taken to avoid cost and damage to the environment. Stolen Boats Canada is available to post, free of charge, any abandoned or wrecked vessels where your municipality or agency is attempting to identify an owner. 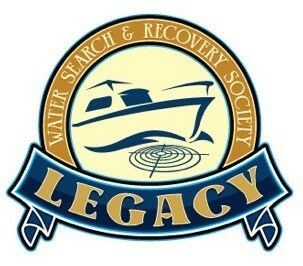 For additional resolutions to this issue, please check out www.recyclemyboat.com . When thinking about what speed you are traveling in your vessel, think in “FEET PER SECOND”. Build into this calculation the “Perception Response Sequence”(PRS) which is the time to (1) Detect a Hazard, (2) Identify the Hazard, (3) Decision on Action and (4) Reaction. Studies have shown that this sequence takes 0.5 to 0.6 seconds under clinical conditions and doesn’t include the amount of time for the vessel to respond to the operator’s actions. ensure your vessel, safety gear and skill level are prepared. Please take a moment before setting out. Check with local boating safety authorities for safety tips and information. According to the BC Coroners Service more people drown every year in the Interior and specifically in Okanagan Lake than any other area of the province. Just make sure that you know your waterways, you don't drink and boat, you have your proper equipment and be mindful that weather plays a big factor. Just a reminder to boat owners, you are responsible for your vessel and any environmental damage that it may cause, even if it is a result of improper anchoring or neglect. Clean up and removal can become extremely expensive and you as the vessel owner may find yourself being held responsible for all costs. As a vessel owner, it is your responsibility to ensure your vessel is securely anchored and safely operated at all times. Do you know where your vessel is? Do you know what your insurance policy covers? 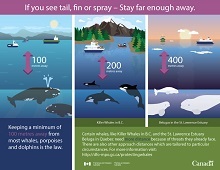 The waters of Canada, both tidal and fresh, have many hidden hazards. One of the most hazardous is a “Deadhead” or “Widow Maker”. 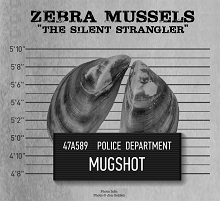 Deadheads present an extreme hazard to vessels and in tidal areas, deadheads can cause significant damage to marinas and the vessels moored within. Please remember to keep a constant watch and travel at a safe speed. If you spot a deadhead, please contact the Canadian Coast Guard (Pacific Region VHF 83a) or contact them by phone and provide the deadheads position, size, how much of it is showing above the surface and if you were able to safely hammer a marker into it to warn other boaters. The CCG will give a Securite’ broadcast to warn mariners of the existence of the danger. If you happen to spot a deadhead in the area of a marina, fuel dock, or other floating structure, please make an attempt to notify the facility’s operator in an attempt to mitigate damage to property. According to the Canadian Red Cross – “On average 166 boating related deaths occur in Canada each year. You are responsible for the safety of your passengers. Ensure you have all required safety gear and that it is in an accessible place. Be familiar with your safety gear, know how to use it and instruct your passengers on how to use it. Be prepared for an emergency and have a plan. It is finally Spring and many people are returning to the water to take part in sport fishing and other recreational activities. It is extremely important to remember the hazards that exist during these activities. 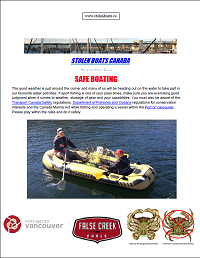 The crew at Stolen Boats Canada wanted to remind everyone to review safety gear requirements, safe boating practices and regulations for conservation and sustainability.